How common are calcium alginate dressings and how long have they been in use? Calcium alginate dressings are not as commonly used as many other types of dressings, including hydrocolloid dressings. In general they have been used in hospitals and medical facilities for approximately fifty years, but the overall size and bulkiness of the dressings have changed. The modern calcium alginate dressings are either available in rope forms for packing into deep cavity wounds, or in flat pad types of dressings in various sizes and shapes. 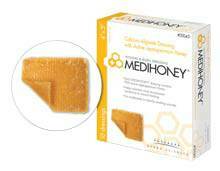 There are a huge range of different options in calcium alginate dressings including dressings with medical grade honey that aids in the healing of wounds and burns as well as dressings with silver added, a known wound healing agent. With an occlusive cover, these dressings are starting to come back into popular use in a wide variety of clinical and home health care wound treatments. Are calcium alginate dressings easily biodegradable and what specifically are they made from? As the name implies the major component of calcium alginate is seaweed, which is highly absorbent and produces a natural gel like substance when exposed to liquid. The various processes used in the production of calcium alginate dressings prevent the seaweed from flaking off in fibers, and allows the rope or dressing to be easily removed from the wound or wound bed. Unlike other dressing products, calcium alginate will not stick to wound tissue, making it a perfect choice for deep wounds or even surface wounds that need moisture to heal effectively. As a natural product, calcium alginate dressings are easily biodegradable and completely destroyed by incineration. Other additives to the calcium alginate dressing may produce different compounds during incineration, but they are in extremely small amounts. Since used dressings are disposed of as biohazard material, this is not typically a concern that needs to be addressed by a medical facility, but it may be an issue in a home health care situation. Clear guidelines on the destruction of these materials should be available. What are the main uses for calcium alginate dressings, and when are they not acceptable to use? In general, calcium alginate is effective for any wet wound that is producing mild to heavy exudate. The fibrous sheets or pads are a good option for shallow wounds such as ulcers, while deep cavity wounds are best treated using ropes of calcium alginate that form to the contours of the wound bed without causing irritation or problems when the dressing is changed. Any painful wounds or wounds that need constant dressing changes and produce exudate are also ideal candidates for the use of a calcium alginate dressing. Sloughy wounds that require moisture on the surface to prevent damage to the periwound skin are also a good match for this dressing. Since the calcium alginate needs moisture to produce the gel, a dry wound is not a good match for this type of dressing.